The UK government has offered to take 3,000 extra lone refugee children in its existing resettlement scheme for Syrian refugees. But the offer has two caveats: it is only for refugee minors currently living outside the European Union and it is spread over five years, meaning there will be an average of 600 per year. The government’s press release called it “The largest resettlement programme for refugee children.” But others, including the Labour peer Alf Dubs have called it “a deliberate ploy to muddy the debate”. The government’s announcement came ahead of a vote in the House of Commons on an amendment to the Immigration Bill proposed by Dubs to let 3,000 unaccompanied refugee children who have reached the EU come to Britain. The amendment has cross-party support and may be successful in overturning the Conservatives’ slim majority of 12 in the House of Commons. Record numbers (over 90,000) of unaccompanied asylum seeking children have reached the EU in 2015 and the trend continues this year. But many are left vulnerable to exploitation and violence while living in appalling conditions in makeshift encampments across Europe. 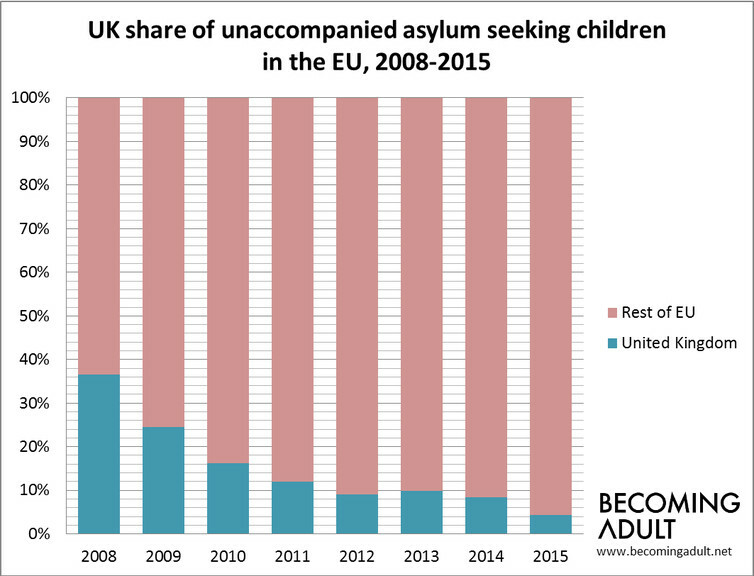 The UK share of unaccompanied asylum seeking children in the EU has significantly decreased during the refugee crisis – from 36% in 2008 to 3% in 2015, as the graph below shows. In 2015, the UK received around 3,000 lone refugee children, certainly an increase from 1,945 the previous year – but this is nothing like what other EU countries have experienced in 2015. According to EUROSTAT, Norway saw an increase of applications from unaccompanied minors from 940 in 2014 to 5,050 in 2015; the Netherlands went from 960 to 3,800, and Germany from 4,400 to 14,400. Sweden alone received in 2015 over 35,000 unaccompanied asylum seeking children: this is more than the whole EU in 2014 and significantly more than the 23,000 that the UK received overall between 2006 and 2015. The government’s claim of having proposed “the largest resettlement programme for refugee children” may actually be factually untrue. Canada has resettled 25,000 refugees since December 2015, although it is unclear how many are unaccompanied children. So let’s keep the “generous” government offer in perspective: much more must and can be done. The Labour amendment to the Immigration Bill that the government is trying to block is a positive step in the right direction: one of solidarity with fellow EU member states that recognises the crisis is now and young refugees need help urgently rather than in 2020. 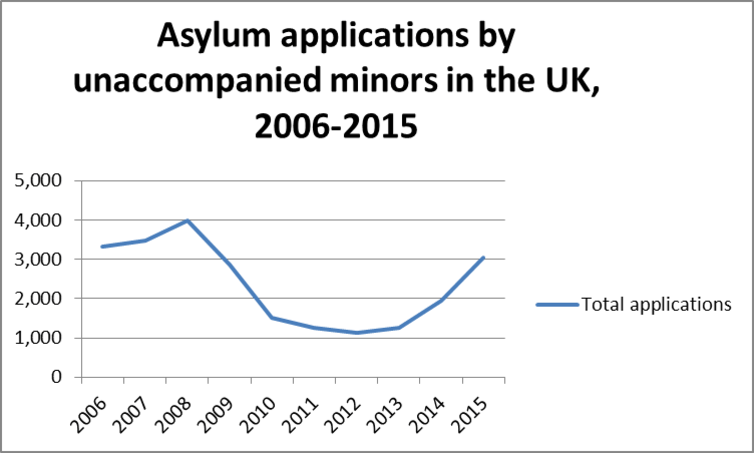 If successful, the Dubs amendment would increase the UK share of unaccompanied minors seeking asylum in the EU to around 6% – still well below previous years. In the mid-2000s, when there was no refugee crisis on the scale that the EU is experiencing today, the UK was receiving on average 3,000 unaccompanied minors per year, just like now. Applications have been higher in the past. But now we hear from the government that local authorities are unable to cope with current numbers. This may be true, but not because of the refugee minors per se. As emerging findings from our research project Becoming Adult show, the challenges local authorities are facing with current arrivals are far more about draconian budget cuts imposed by the UK government than about the number of unaccompanied minors, which is at a level they were able to cope with in the recent past. This entry was posted in media, migration and mobility, politics and tagged asylum, Dubs Amendment, immigration, immigration bill, refugee, UASC, UK, UK government, unaccompanied minors. Bookmark the permalink.